Traffic was back to normal Sunday on the southbound freeways leading into Mexico at the San Ysidro Port of Entry, after they were closed for protests Saturday night. The closures were due to protesters south of the border who were angry over rapidly inflated gas prices, according to authorities. The California Highway Patrol closed southbound Interstates 5 and 805 for almost four hours beginning at about 5:30 p.m., diverting cars attempting to enter Mexico to the Otay Mesa border crossing. Northbound traffic was not affected by the protest, according to officials. 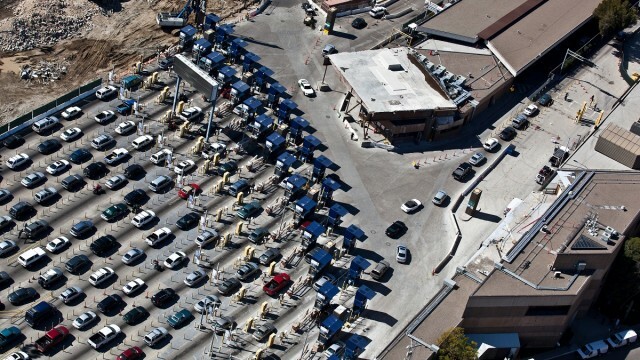 The closures and subsequent traffic jam in the area were prompted by protesters unhappy about increasing gasoline prices in Mexico who had overwhelmed the El Chaparral Port of Entry in Tijuana. Southbound traffic was diverted to state Route 905 during the freeway closures. Demonstrators said they would return to the Tijuana crossing Sunday, but that had not materialized as of early afternoon, with a CHP spokeswoman saying that traffic was normal.